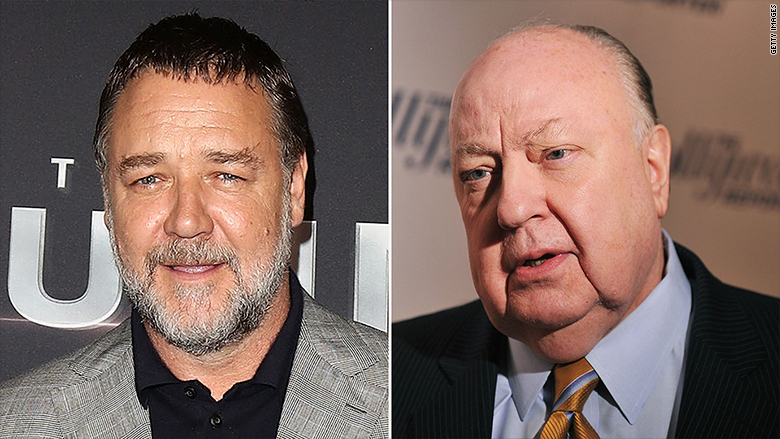 Russell Crowe will play Fox News founder and chairman Roger Ailes in a new miniseries for Showtime, the network announced on Monday. The series, which will run for eight episodes, is based the reporting by journalist and Ailes biographer Gabriel Sherman, who wrote, "The Loudest Voice in the Room: How the Brilliant, Bombastic Roger Ailes Built Fox News -- and Divided a Country." Tom McCarthy, the director of "Spotlight," will executive produce with Jason Blum, who produced "Get Out." McCarthy co-wrote the initial episode with Sherman, Showtime said in its press release. "In many ways, the collision between the media and politics has come to define the world we live in today. We've seen this phenomenon depicted on screen as far back as the story of Charles Foster Kane, and it finds contemporary embodiment in the rise and fall of Roger Ailes." David Nevins, Showtime's CEO, said in a statement, in reference to the fictional main character in "Citizen Kane." Nevins added that with Crowe in the lead role, the series "promises to be a defining story for this era." The series will be told through multiple points of view and will focus on Ailes' rise and fall at Fox News. Ailes, who resigned as Fox News chairman in 2016 amid amid sexual harassment allegations, died last year at the age of 77. He's credited with playing a significant role in helping to establish Donald Trump as a credible political figure during the 2016 campaign by featuring him on Fox's programs. "To understand the events that led to the rise of Donald Trump, one must understand Ailes," Showtime said in its announcement. "The upcoming limited series takes on that challenge, focusing primarily on the past decade in which Ailes arguably became the Republican Party's de facto leader, while flashing back to defining events in Ailes' life, including an initial meeting with Richard Nixon on the set of The Mike Douglas Show that gave birth to Ailes' political career and the sexual harassment accusations and settlements that brought his Fox News reign to an end." Crowe, who won Best Actor for 2000's "Gladiator," is one of the biggest and most recognizable stars in Hollywood starring in acclaimed films such as "A Beautiful Mind" and "L.A. Confidential" and blockbusters such as "Les Miserables" and "Man of Steel."